Trinidad and Tobago is a twin-island republic situated at the southernmost end of the Caribbean archipelago. It borders the Caribbean Sea to the north, the Atlantic Ocean to the east, and the Gulf of Paria to the west. It is outside the hurricane belt that affects other parts of the Caribbean and boasts two deep-sea harbours – the capital’s Port of Spain and Point Lisas. Taken together, these factors have helped the republic develop into one of South America’s key transshipment hubs. It is also well-suited for providing nearshore services to North America, given that it shares the same time zone as the East Coast of the US and has a native English-speaking population. 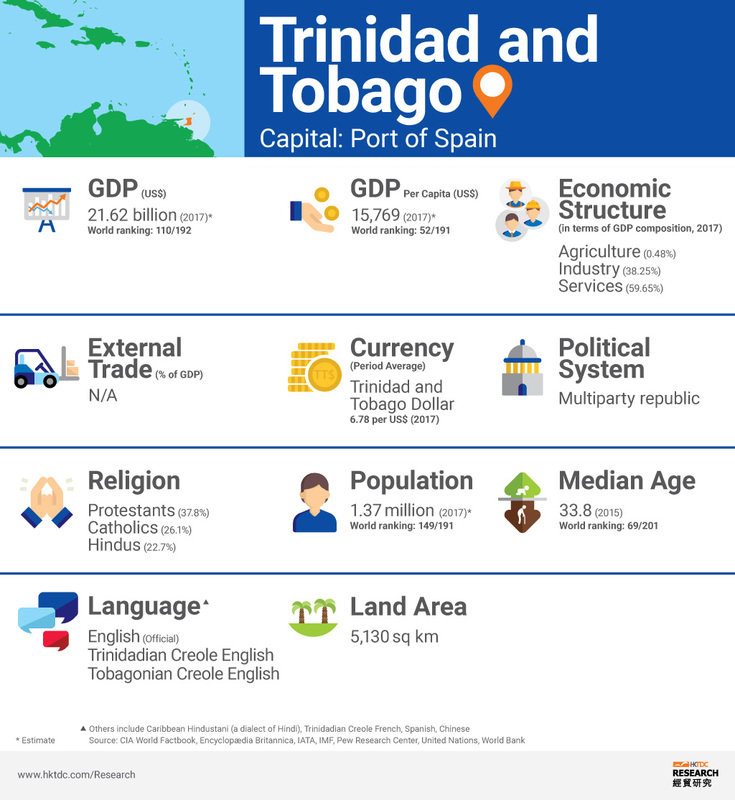 Since gaining independence from the UK and becoming a member of the British Commonwealth in 1962, Trinidad and Tobago has emerged as one of the most industrialised countries in the English-speaking Caribbean. It has been actively involved in establishing trade and investment agreements. These include bilateral investment agreements with Canada, mainland China, France, the UK, Germany, South Korea, Spain, Mexico and India, and trade agreements with Cuba, the Dominican Republic, Venezuela, Panama, Colombia, Guatemala, El Salvador and Costa Rica. The country’s membership of the Caribbean Community (CARICOM) and CARICOM’s Caribbean Single Market and Economy (CSME) has helped deepen its economic integration with many of its neighbours and brought it greater economies of scale and opportunities to reach out to talents, goods, services and capital within the region. Thanks to its large reserves of oil and gas, Trinidad and Tobago not only has some of the lowest energy costs in the world, but is also a major supplier of liquid natural gas (LNG) to the US, as well as a leading exporter of methanol and ammonia. It is estimated that the country’s energy exploration and production currently accounts for about 40% of its GDP and government revenue, as well as 90% of its exports. In 1988, in a bid to diversify its economy and bolster investment in export-drive projects, the government of Trinidad and Tobago established a Free Trade Zones programme. This was intended to attract non-energy based projects that create jobs, develop skills and create external markets for products. Under this programme, the government offers interested and eligible investors generous incentives, including tax exemptions and the freedom to repatriate funds. More information on the investment environment and regulations can be found at InvesTT. More recently, the government increased its efforts to encourage foreign investment with a range of incentives specifically focused on non-energy targeted sectors. These include ICT (animation studio, BPO and English voice services, and global services internationalisation services), agriculture & agro-processing (chocolate manufacturing and cocoa processing), maritime services (offshore bulk transshipment and dry-docking services), aviation services (aircraft maintenance and repair), fish & fish processing, creative industries, manufacturing (silicon cluster), tourism (hotels and resorts) and financial services. After years of fast growth, inflows of foreign direct investment (FDI) into Trinidad and Tobago moderated and turned slightly negative in 2016. According to the Central Bank of Trinidad and Tobago, China’s total stock of FDI in Trinidad and Tobago exceeded US$606 million as of the end of 2016, up from US$0.8 million in 2007. Investment from Hong Kong, however, is at present far from significant.